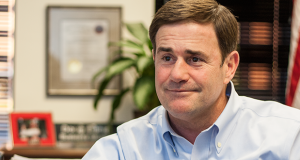 A former state attorney general wants Arizonans to vote to constitutionally ban anonymous donations from political campaigns. The Arizona attorney general has added to the troubles of the photo radar industry by declaring that photo enforcement companies are subject to licensing requirements for private investigators. There’s no certainty a proposed initiative to eliminate “dark money” will make the ballot or whether voters will approve it, but if either happens, it will face litigation. Open and Honest Coalition leader Terry Goddard said yesterday that the campaign anticipates legal challenges, and some attorneys have begun predicting which legal issues could scuttle the anti-dark money initiative. A coalition looking to dramatically overhaul Arizona’s election system filed initiatives Thursday.